Better on Toast features delicious, quick, easy-to-follow recipes for toasts with every possible topping—from hot to cold and savory to sweet. Anyone can make delicious toasts, no matter his or her level of experience or kitchen size. Whether you use thick-cut French bread, slices of whole wheat, or her gluten-free bread recipe, Jill puts emphasis on flavor, using quality, wholesome ingredients to make each recipe stand out.For more information or to purchase, please click here. 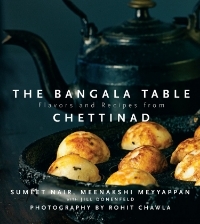 A compilation of recipes from the home and hotel of Meenakshi Meyyappan and the MSMM family in the Chettinad region of Tamil Nadu in southern India. These recipes reflect the worldly history of the Chettiars, incorporating traditional Indian treats as well as techniques and cuisines picked up around the globe and reinterpreted in their homes. For more information or to purchase, please click here. Party Like a Culinista is a menu-based cookbook, ideal for making easy dinners and throwing parties that balance health, fun, and mouthwatering dishes. For more information or to purchase, please see the website. After living in Madagascar, Jill wrote the first and only English language cookbook on cuisine and cooking from Madagascar. For more information or to purchase, please see the website.